Replica in the Deutsches Technikmuseum, Berlin, dated 1914. 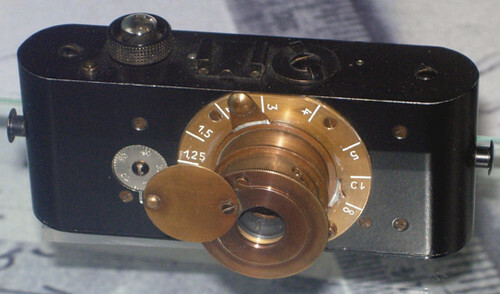 The Ur-Leica was a prototype 35mm camera, using Kino film (35mm film) - designed by Oskar Barnack in 1913-14. This was later (1923,1925) developed into the Leica range of viewfinder cameras which later (1932) was further developed into the range of Leitz's famous Leica 39mm screw mount rangefinder cameras which were copied by uncountable other camera makers. This page was last edited on 12 October 2011, at 18:12.